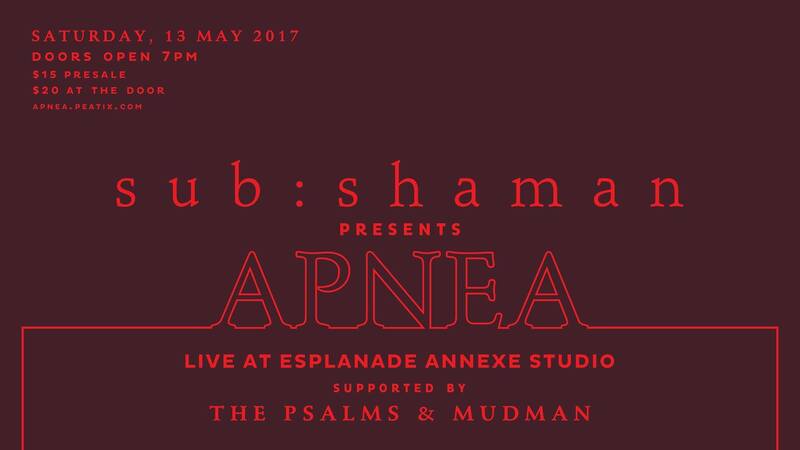 Hot off the release of their incredible lead single 'A-Hole' last week, Singaporean alternative band sub:shaman have announced that they will be officially launching their highly-anticipated Apnea LP with a concert at Esplanade Annexe Studio on Saturday, 13 May. The showcase will see the five-piece outfit performing their full-length debut album live, and in its entirety, just one day after their nine-track record is released worldwide on Friday, 12 May. Alongside the band, long-time collaborator and renowned mixed media artist Marc Gabriel Loh will also be on hand to provide thrilling live visuals during the band's set. For those unfamiliar, Marc has been a key behind-the-scenes figure with the band, responsible for the sub:shaman's artwork and visual output through numerous projects, including the their acclaimed 2014 EP Outsider. In addition, this launch showcase will also feature two incredible supporting acts in the form of experimental alternative rock outfit The Psalms and the exciting live debut of Mudman (made up of former Cashew Chemists members). Pre-sale tickets are $15, while door tickets will be priced at $20 (cash only). Pre-order Apnea today, and listen to their lead single 'A-Hole' below.